Perfect for kiosk, jewelry stores, low-volume customisation, and gift shop applications, the new Roland VersaUV LEF-12i Benchtop UV Flatbed Printer is a low-cost, easy-to-operate solution for personalizing a variety of valuable items and making them even more unique and profitable. 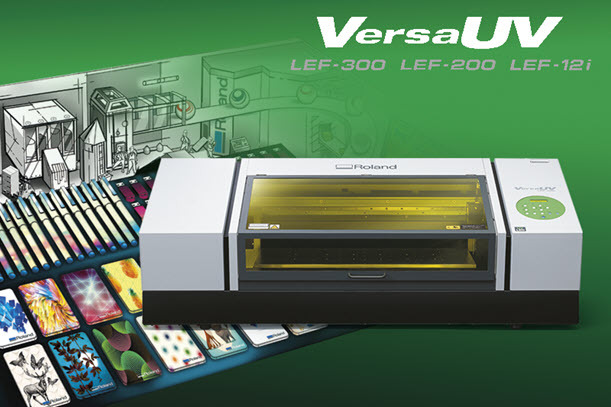 With a host of options, the Roland VersaUV LEF-12i offers countless product customization and substrate possibilities, including printing directly on three-dimensional objects up to 3.94” thick. With the magic of Roland VersaUV LEF-12i flatbed UV printing, you can print graphics and add stylish finishes to standard substrates as well as unique promotional items. Gloss ink option enables spot gloss or matte finishes, as well as highly unique embossed effects. You can print on three-dimensional objects with ECO-UV inks that image brilliantly and stretch around complex corners and curves. It's perfect for pens, smartphone covers, personalized awards, giftware and so much more. You can even add White ink as a spot color, or as a flood behind CMYK on dark backgrounds and clear materials. Using state-of-the-art UV-LED lamps, the Roland VersaUV LEF-12i is a low-heat, cool-running machine, that combines with vibrant ECO-UV inks, to print on the following materials: PVC and Plastics, Leather And Fabric, Canvas, Metal, Glass, and Wood! The Roland VersaUV LEF-12i feature energy-saving LED lamps that last up to ten times longer than conventional UV lamps. These can be instantly switched on and off for a true on-demand operation that doesn’t require a long warm-up time. In addition, the LEF has an automatic low-power mode that is switched on when not used after an extended period. To ensure optimum print quality when printing around curves, mist filters have been added to the Roland VersaUV LEF-12i to collect the residual ink-mist when printing off the edge or curve of an item. This reduces overspray and stops ink from settling on internal parts. The filters are also designed to be easily replaceable by the end user. Roland VersaUV LEF series printers includes new VersaWorks 6 RIP software, featuring a new HARLEQUIN dual-core engine for faster previewing times and improved handling of PDF and EPS files, including files with drop-shadows and transparencies. In VersaWorks 6 you can automatically generate White, Gloss, and Primer layer directly in the RIP software with a Special Color Plate Generation feature. Users can also rotate, set spacing and Maintain Clip Position within the RIP to give you more control when printing graphics and applying Gloss Ink effects. Roland VersaWorks 6 also offers a host of advanced features that include five print queues and five hot folders— combined with the ability to store unlimited queue settings and native 64-bit processing that enables users to nest up-to 86 jobs and other increased capabilities. Printing white and CMYK onto bottles and cylindrical objects is an absolute snap with the new RotaPrint attachment for the Roland VersaUV LEF-12i flatbed printer. Simple to install and remove, it utilizes the Roland VersaUV LEF-12i’s existing feed system and enables the Roland VersaUV LEF-12i to print cleanly and precisely onto a wide range of materials with a diameter between 1.6 to 3 inches (40 mm to 77 mm). With its sturdy build, RotaPrint is also consistently and reliably accurate, ensuring precise stepping during rotation. Acceptable Media Max: 12.2" X 13.2" X 3.94"
Dimensions: Width: 39.3", Depth: 34.2", Height: 21.5"
The Roland VersaUV LEF-12i makes it fast and easy to print on a wide range of materials to create unique products to ensure your business succeeds. We have additional Introduction and Training Videos for the Roland VersaUV LEF-12i. Want to learn more about the Roland VersaUV LEF-12i and UV Printing? Want to learn more about the Roland VersaUV LEF-12i? Download the Roland VersaUV LEF-12i Brochure. Perfect for kiosk, jewelry stores, low-volume customization, and gift shop applications, the new Roland VersaUV LEF-12i Benchtop UV Flatbed Printer is a low-cost, easy-to-operate solution for personalizing a variety of value items and making them even more unique and profitable. With a host of options, the Roland VersaUV LEF-12i offers countless product customization and substrate possibilities, including printing directly on three-dimensional objects up to 3.94” thick. The Roland VersaUV LEF-12i feature energy-saving LED lamps that last up to ten times longer than conventional UV lamps. These can be instantly switched on and off for a true on-demand operation that doesn’t require a long warm-up time. In addition, the Roland VersaUV LEF-12i has an automatic low-power mode that is switched on when not used after an extended period. Roland VersaUV LEF-12i printers include new VersaWorks 6 RIP software, featuring a new HARLEQUIN dual-core engine for faster previewing times and improved handling of PDF and EPS files, including files with drop-shadows and transparencies. In VersaWorks 6 you can automatically generate White, Gloss, and Primer layer directly in the RIP software with a Special Color Plate Generation feature. Users can also rotate, set spacing and Maintain Clip Position within the RIP to give you more control when printing graphics and applying Gloss Ink effects. Roland VersaWorks 6 also offers a host of advanced features that include five print queues and five hot folders— combined with the ability to store unlimited queue settings and native 64-bit processing that enables users to nest up-to 86 jobs and other increased capabilities.